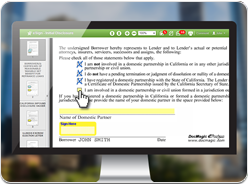 TORRANCE, Calif., May 11, 2015 -- DocMagic, Inc., the premier provider of fully-compliant loan document preparation, compliance, eSign and eDelivery solutions, announced today that its eSign platforms have now processed more than 100 million mortgage-related eSignature transactions. "We are very pleased with the sheer number of eSignatures that we are seeing executed among our client base," said Dominic Iannitti, president and CEO of DocMagic. "This is positive news for the mortgage industry as a whole. In previous years, eSign adoption was much lower among lenders working with borrowers. 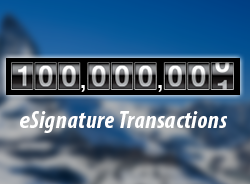 We have always encouraged clients to take advantage of our eSigning technology; this impressive number of transactions certainly reflects that." Introducing DocMagic's New eSign Experience! Convenient and Compliant for you! Coming February 1st, a new look and intuitive features make DocMagic’s eSign platform better than ever – giving you a fast and compliant electronic document signing, management, and storage process! Just for borrowers, we focused on signer-friendly improvements designed to enhance the signing experience!